The mini monarch of a tiny Filipino enclave could have some lessons for the world. Words and images Roderick Eime. “Yes your majesty, everything is arranged. No, thank you your majesty, we have everything we need.” And with that, Orion expedition leader, Justin Friend, flipped his Nokia shut and breathed a sigh of relief. 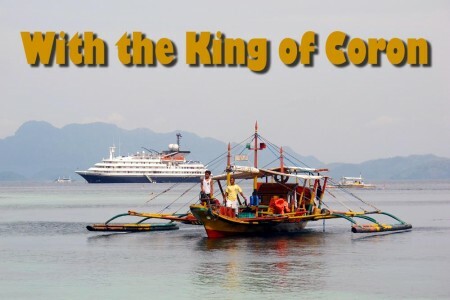 We are about to meet His Royal Highness HM Tribal Chieftain Rodolfo Aguilar I in his ancestral kingdom, the island of Coron. Orion II has just dropped anchor in the narrow straight between Busuanga Island and its lesser satellite, Coron, in the Sulu Sea about 300km SSW from Manila. It’s a wild part of the Philippines for sure, inhabited by the northern (or Calawian) Tagbanua people who are quite possibly the oldest ethnic group in the entire Philippines. Despite his miniscule dominion, HRH Rodolfo is not a monarch to be trifled with. Together with his Council of Elders, he obtained a Certificate of Ancestral Domain Title for his people in 1998, a Native Land Title by any other name. In the hotbed of Filipino politics, that’s no mean feat and it means he has all-but-absolute rule over this ethnic enclave that includes not only the rugged limestone islands, but also the much prized fishing grounds. Perched on the gunnels of our Zodiac tenders, the floppy-hatted delegation motors toward a secluded beach on Coron Island, just out of sight of the main township across the strait on Busuanga. Our landing site is a sheltered cove overseen by towering basalt cliffs splattered with gnarly outcrops of awkward-looking shrubs clinging to the sheer walls. During the Second World War, these craggy alcoves hid warships and transports of the Imperial Japanese Navy as they made the treacherous voyage between Japan and the battlefronts of Borneo and Papua New Guinea. With the Allies on the front foot in the closing months of 1944, twelve ships laden with urgent supplies for the beleaguered Japanese forces were located by Allied aircraft and promptly sunk at anchor. This ‘ghost fleet’ of Coron is now one of the world’s best locations for wreck divers and little dive shops dot the main street in town catering to the constant trickle of aquanauts arriving from all over the world. 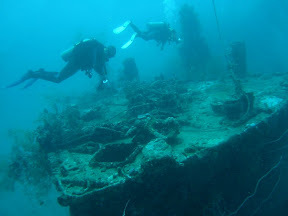 Mostly stripped of their valuable contents by post-war salvagers, the bare hulks are easily explored by divers of modest ability in depths of around 25 to 30 metres. Colourful marine organisms have attached themselves to the rusting relics while batfish, stone fish, barracuda, lion fish - and scores of others whose names I've never learned - patrol the decks and open holds where doomed Japanese seamen once fought to defend their vessels from dozens of dive bombers. As our tiny flotilla approaches the delicate little beach, we can see all is in readiness for the royal occasion. Makeshift picnic shelters and benches festooned with local flora await our bottoms while local villagers bustle about with last-minute preparations. Unloaded and ashore, we gather in anticipation as HRH prepares to greet us. Meanwhile, Justin, who spent weeks in the region organising this regal occasion addresses the gathering. Justin proceeds to make a theatrical sweep of his arm, symbolically embracing the gorgeous bay, its aggressive basaltic grandeur and all who camp within. I get the feeling he’s been rehearsing this moment. And with this none-too-subtle cue, an unassuming gentleman breaks from the ranks of the locals and steps forward to address us. No mink or ermine nor pearled crown, King Rodolfo’s regal accoutrements extend to a clean, collared polo shirt adorned with a delicate yellow scarf and crisp denim shorts. A pair of well-worn blue Crocs completes the ensemble. Through an interpreter, his majesty greets us and we join him in a short prayer. The Tagbanua people are nominally Christian although adherence to traditional rituals and beliefs is strong. They have their own distinct language and even a unique script, but those with the knowledge of the ancient tongue are dying out. With the solemn ceremony over, the gathering is treated to a display of traditional Tagbanua dance. It’s raw and rudimentary without lavish props or production, but the significance is not lost. The courting dance, or segutset, in particular, is unmistakable and Justin looks like he may be spirited away into the jungle at any moment by a particularly enthusiastic female member of the tribe. While his subjects quickly dispense with formality and embrace us in the festivities, King Rodolfi maintains an aloof air as he taps rhythmically on a skin drum. He is king after all. The imposing basalt cliffs that protect us from the blazing sun also provide a valuable resource for the Tagbanua: swift nests. These tiny birds nest high in the cliffs in little nooks and on ledges 100 metres and more above us. 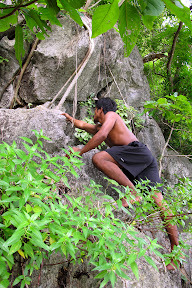 One athletic young man, eager and proud, climbs the sheer walls as we look on holding our breath. Barefoot and clad only in a flimsy pair of shorts, he clambers vertically to an overhang from where he throws us a cheery wave. Swift nests have been used in Chinese cuisine for hundreds of years and a kilo of saliva that forms the little birds' nests can be worth up to $10,000. The king, therefore, is mindful of potential disturbance to his fragile resource and tourism like ours is cautiously welcomed as long as it doesn’t impact on his hard-won cultural and economic independence. After a day of lazing in the opal hued waters around Coron and a visit to Kayangan Lake just next door, reputedly the cleanest inland body of water in the Philippines, the party moves back onto Orion II. Our Coron cultural liaison and local eco-hero, young Al Linsangan, musters his minstrels on the rear deck and enthrals the dinner guests with a hauntingly soulful repertoire of local rhythms set to modern electronic instruments. As the well-relaxed diners tap their feet to Al and his troupe’s cheery ballads, I can’t help feeling he’s singing a song of optimism and hope. Will the tiny Tagbanua community thrive or shrivel in the gaze of global tourism. I put that thought aside for a moment and sing along. Orion II returns to Coron in 2012 as part of their Yangtze, Ryukyu and Philippines itinerary departing Shanghai 11 July. The 15-day expedition includes stops in Japan, Taiwan and Borneo. Fares start from $10350 per person. Refer to your travel agent or Orion Expedition Cruises for any discounts applicable.